We offer non-wood bows for every player. From basic student fiberglass, to career professional carbon composite models, you will find a perfect bow to match your needs. We are especially pleased with the success of Arcus bows for professionals. Yes, these are costly bows, but our sales indicate customers feel they are worth it. Glasser. These have been the workhorse of student/educational bows for decades. In recent years, Glasser has developed new models for intermediate students, and proficient players. The workhorse of school music programs and rental programs around the world. Same as the original model, but has real metal wrap and leather grip. Step-up performance for advancing students. Real Ebony frog with Parisian Eye. New design that offers graphite performance at a moderate price. Made of advanced composite materials for advanced students and other serious players. Ebony frog with Parisian eye. These bows can be special ordered with particular weight and balance. Email for more information. For serious players with highest performance needs. That's not just paint on the stick. You see the actual braided material used to make these bows, which is a patent-pending design. Also features aesthetics such as an elegant head, Ebony frog with oversized pearl eye with ring, and nickel/silver head plate. Eastman. Fiberglass, Composite, and Cadenza model bows. Eastman (K Holtz) Carbon Composite. Core Select. Made in China. Carbon bows for students and advancing players. These bows compete favorably with higher priced brands of carbon bow. Carbon-Graphite composite stick. Real Ebony frog with Parisian eye. Carbon-Graphite composite stick, with woven look. Real Ebony frog with Parisian eye. Carbon-Graphite composite stick, with woven loop in Red or Blue finish. Ebony frog has decorative inlay design. Revolutionary new synthetic material which allows for a standard weight range, extra rigidity, and high resiliency for a fantastic level of performance at this price. Carbon stick with pernambuco covering. Fully lined ebony frog with Parisian eye, and special nickel silver winding. 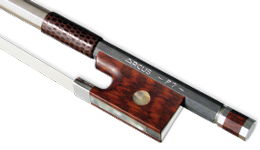 Arcus Professional level bows made in Switzerland. Some of these models have matched the performance characteristics of the finest wood bows. Other models have surpassed what wood can do. The materials used don't just allow Arcus to create bows with a wonderful sound and perfect playing properties. They can also adjust the resiliency, the weight and the balance with much more freedom and precision than with conventional materials. The complex texture of the carbon fibres still gives each bow its individual character and tonal beauty.Testimonials from customers that have purchased Arcus bows is overwhelmingly positive. In the words of one Cellist that owns an Arcus bow, "I feel like I'm cheating when I play this bow". Similar to the S Series, but a little heavier, and with a warmer tone balance. 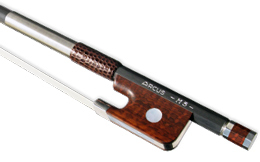 Darkest tone balance of all Arcus bows, and a perfect fit for the darkest sounding instruments. A heavier bow compared to other Arcus bows, but still exceptionally light compared to wood bows. Very quick response. Brilliant, focused tone. Model C2 Shown.